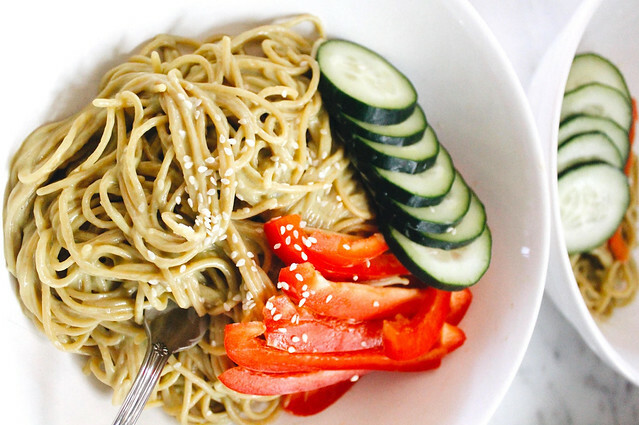 If you strive to avoid gluten-rich wheat noodles but find yourself missing the occasional bowl of pasta, you may find the perfect fix in soba noodles. 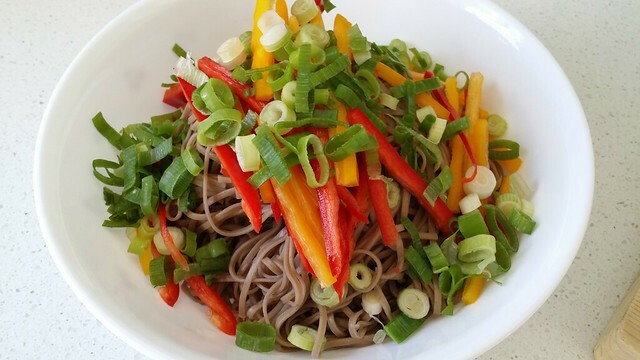 Made mostly with buckwheat and long used in East Asian cuisine, soba noodles are very easy to prepare and are readily available in Asian markets and grocery stores in larger cities. 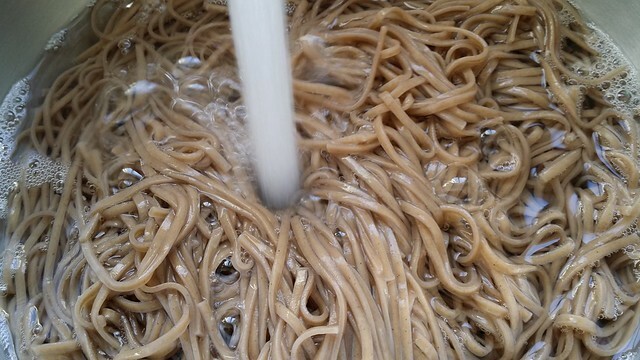 Most varieties of noodles that are low in or devoid of gluten require constant attention while boiling and leave a gooey mess of cooking water to deal with after. Not with soba. 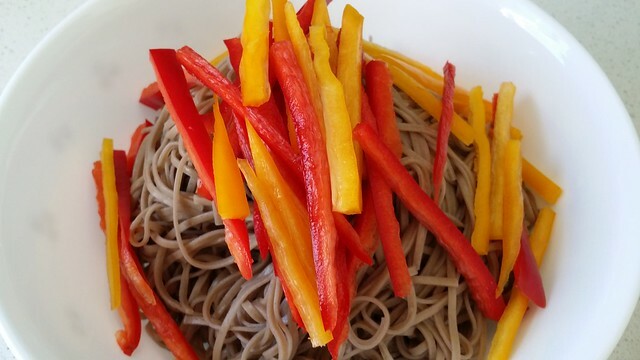 Three to four minutes and they're ready to go, and unlike grainy whole wheat pasta, soba noodles have a delightfully clean and smooth feel about them. Though buckwheat isn't a true grain, it's an excellent substitute for staples like wheat, corn, and even rice, as it ranks lowest of all common grains and corn on the glycemic scale, which makes it a smart choice for lowering your risk of developing blood sugar and insulin-related issues. Buckwheat actually provides more healthy protein than wheat, corn, rice, or millet. 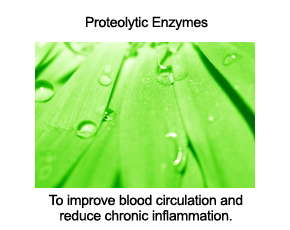 It's also known for its ability to help prevent hypertension by decreasing activity of angiotensin converting enzyme. 1. In a medium bowl, combine almond butter, soy sauce (or tamari), rice vinegar, and minced garlic. Give everything a good whisk to blend. Add up to 1/2 a cup of water as you whisk to create a rich sauce - you don't want it to be too thin. Set aside. 2. Cook soba noodles in a pot of boiling water - follow the directions on the package; typically, it only takes about 3 to 4 minutes to cook soba noodles to the al dente stage (somewhat firm with a nice chewy texture). Drain and rinse under cold water, then transfer cooked noodles to a large bowl. Toss cooked noodles with a tablespoon of sesame oil so all noodles have a light coat. 3. 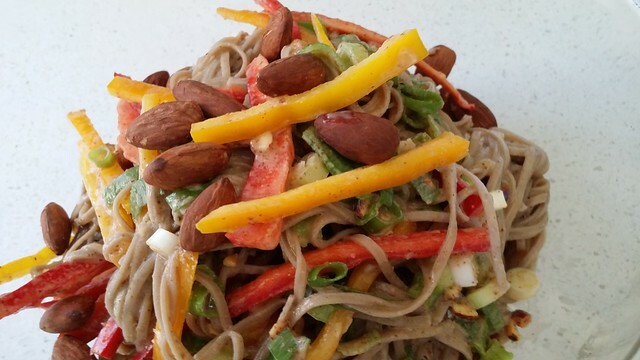 Add peppers and green onions to your noodles, along with your almond butter sauce made in step 1. Toss gently to combine. 4. Refrigerate for half an hour before serving. Garnish with roasted almonds (sliced or whole) just before serving. As you can with any recipe, feel free to add other ingredients to the mix. 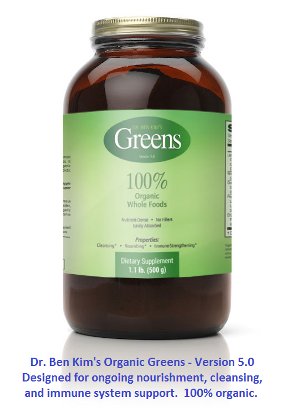 If you want more of a sweet and crunchy texture, you can include thinly sliced carrots or red beets. For some heat, add some chili powder or flakes to your sauce. If you have a favourite recipe that calls for Soba or other forms of buckwheat, please consider sharing via the comments section below. Thank you. I love buckwheat and enjoy it in many forms; however, it should be noted that some brands of soba also contain wheat. Please read labels carefully! Costco now carries two varieties of gluten free noodles, one made exclusively from black beans the other from edamame. Recipe looks great! Question: why are 100% buckwheat soba noodles so hard to find? The brands I've seen always contain wheat. 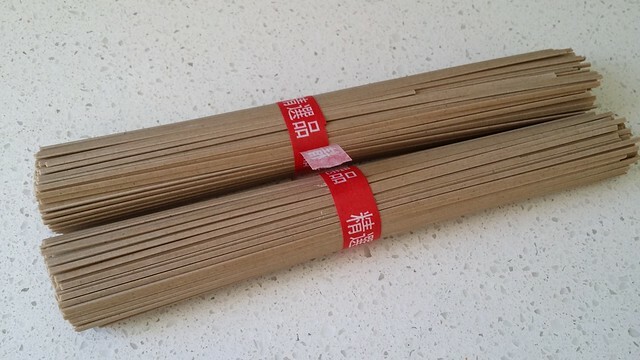 I live in San Francisco, are 100% buckwheat soba noodles available in Asian groceries? Thanks for mentioning the deformed version of wheat that's grown in the U.S. - no wonder bodies get deformed from ingesting it. As always, your articles are helpful and informative without being heavyhanded.